The Centennial State is home to some top-notch hot dog joints that compete with the best in the nation. No matter if you’re looking for a famous Chicago-style dog, Coney Island-style dog, or a dog unique to the Colorado, we’ve got a frank for you! These 10 best hot dog joints in Colorado have gained reputation for offering the best from traditional classics to off-the-wall additions. Enjoy! Biker Jim’s Gourmet Dogs is the most popular hot dog joint in Colorado. 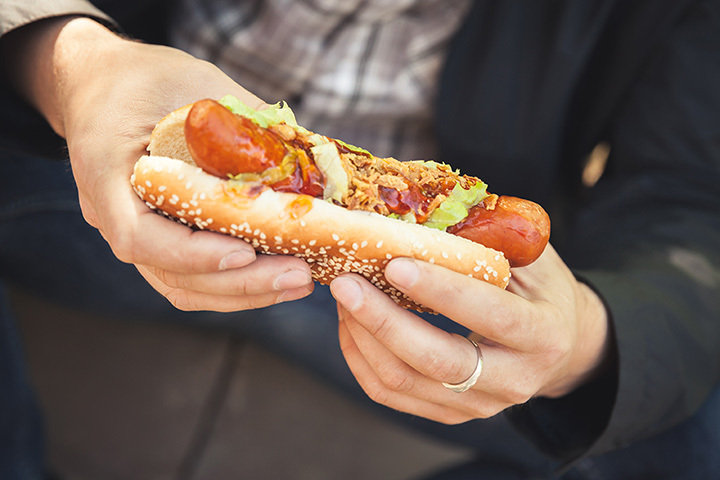 Find hot dogs made from a variety of meats, including reindeer, elk, boar, rattlesnake, pheasant and buffalo. At Biker Jim’s the signature toppings are usually cream cheese and sautéed onions soaked in Coca Cola. Your regular Coney Island hot dog can be found here along with unique toppings, such as roasted cactus, curry jam, caramelized onions or even wasabi aioli. Chicago-style hot dogs are the favorite menu item at this hot dog restaurant. Chicago Style Beef & Dogs is family owned and operated. Order the Vienna hot dogs or the Italian beef sandwich, both topped with traditional toppings. End your meal with Chicago desserts such as Salerno butter cookies or Fannie May candies. This Boulder restaurant, which has been open more than 30 years now, was so good that another has opened up in Denver. Mustard’s Last Stand knows how to make a great Chicago dog but the burgers, fries, chili and vegetarian and vegan options make this place loved by all. No matter if you eat meat or not, you can enjoy a chili dog at Mustard’s. Open in 2008, Mile High Vienna Stand offers Chicago-style hot dogs along with Polish sausage and Italian beef sandwiches. With now two locations in Denver, more people can enjoy the hot dog that was named Best Hot Dog in Denver in 2011. If you have a large crew or you’re just really hungry, get a six-pack of Chicago dogs with all the toppings for just $15. Steve’s Snappin’ Dogs have been serving up Thumann’s New Jersey hot dogs since 2006. You can get a plain hot dog or venture into the more unique topping options. Try the bacon-wrapped and deep-fried dog known as the Mex-Si. Or indulge in the Rippin’ Rockies Dog featuring a deep-friend dog with green chili and grilled onions. Customers love the hot dogs here, of course, but the fried green beans make for a great side. Billy’s Gourmet Hot Dogs in Denver features Vienna beef hot dogs along with gourmet meat dogs such as duck or smoked chicken and apple. The signature dogs come with different toppings that are sure to please any hot dog lover. Don’t forget to get a side of the hand-cut fries. And this hot dog joint does cater to vegetarians and vegans by offering a vegan dog. The Old-Fashioned Italian Deli, operated by a family for two generations now, is the only New York-style hot dog joint you will find in Denver. The first owner, a Buffalo, New York native, moved to Denver in 1976. So it's no surprise why Old-Fashioned Italian Deli only offers Sahlen’s hot dogs. This deli also serves up great calzones and deli sandwiches. If you are seeking the perfect Chicago-style hot dog in Colorado Springs, look no further than Margo’s Vienna Station. This little establishment offers Vienna beef hot dogs, along with Italian beef sandwiches, polish sausage, bratwurst and schnitzel. Margo’s has won “Best Hot Dog” from “Best of the Springs” from 2007 to 2012. Coney Island Hot Dog Stand is more than just a hot dog joint. It’s a roadside attraction. The hot dogs are made in a building that resembles a giant hot dog. The building’s “bun” is 35 feet-long and the “dog” is 42 feet-long. Ever since the new owners took over last year, Coney Island Hot Dog Stand has been serving up local fare from its hot dogs to its ketchup. This family-owned restaurant serves unique hot dogs loaded with any topping imaginable. Harley: A Hot Dog Revolution is truly a revolution. Once you walk into this joint you should forget everything you know about hot dogs. Find dogs topped with pepperoni or even spaghetti.